My family lived in Oklahoma City until I was in the third grade. I have no memory of a phone from those days in the city, although I’m sure we had one as Dad worked for the phone company: Southwestern Bell Telephone. 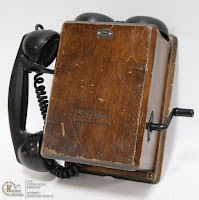 The first phone I remember was the one we had after we moved to the farm in 1951. It was a hand-cranked, four-party phone line. I remember “our” hand-cranked number: two longs and a short. Each person on the party line had a different ring pattern. I have no idea how we got outside out party line; I suppose there was a specific ring pattern for the operator. To this day I can remember cranking that phone. At some point we upgraded to a phone that would only ring when it was for us, although we were still on a party line. We would have to pick up the phone and see if anyone was talking before used it. Courtesy required that calls be kept short, although occasionally someone would chat away for a long time. The same phone courtesy rules dictated that for an emergency you could tell the person on the line to hang up that there was an emergency and you needed to use the phone..
Did that phone still have a crank or did it have a dial? I honestly don’t remember. It was, after all, close to 70 years ago. I can barely remember last week these days. We had the party line at least until I moved away to college in 1960. And I don’t remember ever having a party line after that. I’m sure when I lived in Oklahoma City after leaving home, there were no party lines. I don’t miss party lines, although I always love these little trips down memory lane. But then that’s what happens when the majority of one’s life is behind one. The time ahead is unknown, but I can bet it won’t be another 76 years. Jake, my beloved cat, is 19 years and 10 months old. In human years that’s around 96, depending on which site one consults. I, at 76, am 15 in cat years, using the same scale. We are both old, and it’s something of a race to see who lasts longer. I suppose I will, baring something unthinkable, and I find that very distressing. Jake has been such a presence in my life for so many years, that I can’t imagine life without her. After Tilly, my previous cat, died, I wasn’t going to get another cat. But when Jake was offered and I was told that she had been totally declawed, how could I say no? 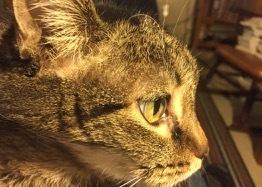 Her first owner had severe asthma, and he had the notion that if Jake were totally declawed, and bathed multiple times a week, he would be able to keep her. He almost died of a severe asthma attack. That man’s mother, a fellow teacher of mine, took Jake and began looking for another home. That same man had had a beloved dog named Jake when he was a kid, so even though Jake was female, he named her Jake. Being superstitious about such things, I kept the name. Jake is the strongest willed cat I’ve ever had. She will have things her way—or one is going to bleed. This is not to say she’s not affectionate, she is, but she will be affectionate on her terms and when she wants. Mostly that works out fine as I’m pretty much the same way. Jake is a one-person cat: she doesn’t like anyone else but me and has no tolerance for visitors. Back in Texas, where I often made Sunday brunch for as many as twelve people, Jake would come out and be in the middle of the event; but should anyone try to pet her, he or she would bleed: look but don’t touch. She had a special animosity toward my brother Ken. He deserved it, as he teased her every chance he got (and he paid in lost blood several times, too). She had a supreme moment over Ken when he came in the back door once to feed her while I was out of town. Jake was on top of the fridge near the back door as he came in. Fearing Jake a bit, for good reason, he was shaken when she was waiting for him on top of the fridge and hissed and swatted at him. He wasn’t expecting it and, frankly, got his just reward for taunting her so often. Revenge, even for a cat, is sweet. I still enjoy that story. Jake seems healthy enough for the most part, but she, like me, has arthritis. I see it when she gets up after lying for a while; that is, she walks like I do after I’ve been sitting for a while. We mirror each other in our limping, slow movements. We have grown old together, Jake and I. A video of the CTA Holiday Train from 2014. Happy holidays! Tchotchke is a Yiddish word meaning knickknack or trinket. More generally, it means stuff, junk, or, if you have delusions of grandeur, collectables. I have a lot. And to me they are indeed collectables. Once I’m gone and someone else has to deal with them, they will be junk and most likely end up in the trash. Writing in The Guardian, Blanche Marvin, age 93, says she’s “never lonely in this house, because I have my life with me.”* I know how she feels. Each time I look at, for example, the shelf pictured above, I am flooded with memories. The little white polar bear I picked up at the San Diego Zoo on a visit there with my dear friend Mollie; the piece reminds me of Mollie, more than of the zoo. The wooden cart near the back on the left I picked up in Costa Rica; what a flood of memories from that trip. The hand-turned wooden container was made by my brother, Ken, who also made the pens inside it. The maroon vase on the far right was a gift from my friend Roger; Roger is gone now, but the vase always brings back memories of our many years of friendship. The little sea bird I picked up on one of my many trips to Port Aransas, which evokes memories of that quaint seaport, Shorty’s Bar, and my friends Crickett and Brad with whom I often traveled there. And the black grand prize ribbon was given to me at my sixtieth birthday party; it says, “Older Than Dirt.” Indeed, especially 16 years on. And that’s just one shelf. More items are scattered over the apartment and some are even stored in a box in my closet; I rotate items occasionally. I keep thinking I should clean up this stuff, downsize this junk. And should I get an expiration date due to some disease or other, maybe I will. But otherwise, I think I’m just leaving these precious items. Let someone else worry about them after I’m gone. Years and years in the future, of course! I'm retired from teaching in Oklahoma and Texas and living in the wonderful city of Chicago. I'm having entirely too much fun!